The Great Recession - What Does It Mean? 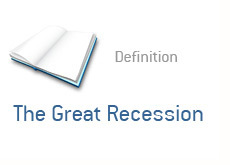 What is the "Great Recession"? The "Great Recession" is the term coined by former Federal Reserve Chairman Paul Volcker to describe the current economic downturn that we are currently suffering through (note: date of this article was May 5th, 2009). Many people are of the opinion that the "Great Recession" is an appropriate way to describe the current downturn. The downturn is certainly more than a run-of-the-mill recession, but it also probably won't end up qualifying as a depression either. Due to the massive amount of liquidity injected into the financial system by the United States and others, this has very little chance of becoming a depression. Most people point to December 2007 as the beginning of the "Great Recession". This is when the precipitous decline in the US housing market led to the explosion of the subprime mortgage market. This is generally regarded as one of the main causes of the "Great Recession". When people point to the root causes of the "Great Recession", they generally point to: inflated housing market driven higher by easy credit, excessive leverage in the financial system, speculative excess in the hedge fund industry, staggeringly high trade deficits and an American consumer that relied too much on credit to finance their extravagant purchases.